This blog originates from Bas Raijmakers' PhD work at the Royal College of Art. All materials from the PhD are available, and also selected examples from later work, with STBY. The participants made short films in groups, in about 1.5 hrs from developing an idea to presenting it. Each film consists of only 3 shots, based on a simple script that focused on an experience during UXHK2012 that was meaningful to at least one person in the group. Some of the films can be seen on Vimeo now. 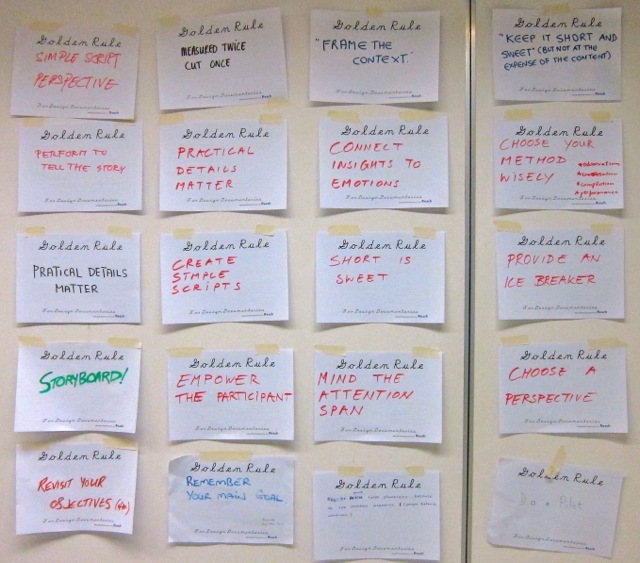 When the films were presented by the groups, each group also mentioned a Golden Rule for the use of film in design research that they used (and in most cases created) during the film making. This entry was written by Bas Raijmakers, posted on March 2, 2012 at 12:37 am, filed under Workshops. Bookmark the permalink. Follow any comments here with the RSS feed for this post. Post a comment or leave a trackback: Trackback URL.